HUD manages the FHA and VA loan-backing program for private mortgages, and while the loans are still being written and approved by private mortgage lenders, the support staff won’t be helping with underwriting and answering questions. As a shutdown continues, the backlog of mortgage applications grows meaning that even when things go back to normal, your application could still take a lot longer than usual. Additionally, if you’re waiting on approval for an FHA Title I loan to start repairs, your loans can’t be processed until the shutdown is over and you have to wait. You can avoid unnecessary delays by getting your paperwork in early and making sure the application is complete so it sails through the process without any problems. Talk to your bank or ask your closing agent for a list to help you make sure your paperwork is in order before submitting it. If a furlough has just started or there are rumors of one, get everything on this list organized and submitted so you can be one of the first to get processed once the government reopens. Conventional mortgages backed by Fannie Mae and Freddie Mac are also still being written, but there’s a snag. You have to fill out the Form 4506-T to allow your lender to access and verify your tax transcripts in order to get one of those loans, and the IRS doesn’t process those forms during a shutdown. However, this doesn’t have to be a deal breaker for your mortgage approval, because many lenders are finding ways to work around this problem. Your bank might be able to give conditional approval for the loan and have your tax transcripts included post-closing. Talk to your lender and see if you qualify for this work-around, but be aware that you might be asked to show as much proof of income as you can, including pay stubs, W2s or 1099s, and bank records. The Department of Agriculture staff processes USDA-backed mortgages, but it’s one of the departments that shutters as soon as a shutdown starts. If you’re in the application process and need a commitment letter, you’re out of luck until the government is funded again and workers return to their desks. Fortunately, there are many other mortgage programs that you can use to purchase your country dream home, although you may need to have a down payment saved in order to qualify. FHA and VA loans could be a good alternative, or you could even explore a rent-to-own contract with the home seller letting you live in the home now with a promise to close at a later date. Your employment has to be verified by the bank to comply with the Truth In Lending Act standards, and this is a problem if you’re a government employee, federal contractor, or member of the military. The National Archives where personnel records are kept isn’t open during a shutdown and no one’s answering the phone to confirm employment which can stall a mortgage application. Luckily, new Fannie Mae guidelines allow military borrowers to use their Leave and Earnings statement as proof, as long as it’s dated within the last 30 days. Lenders also have up until the time of loan delivery to get a verification of employment, giving some extra time after the closing once the government reopens. 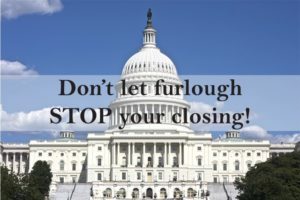 You don’t have to let furloughs keep you from having a quick and trouble-free closing, and communication with your lender and closing agent is the key to working around problems.